Will take place this Sunday evening, 18th December at 7.00 pm with Mulled Wine and Mince Pies afterwards in the Presbytery at Christ the King. All welcome. 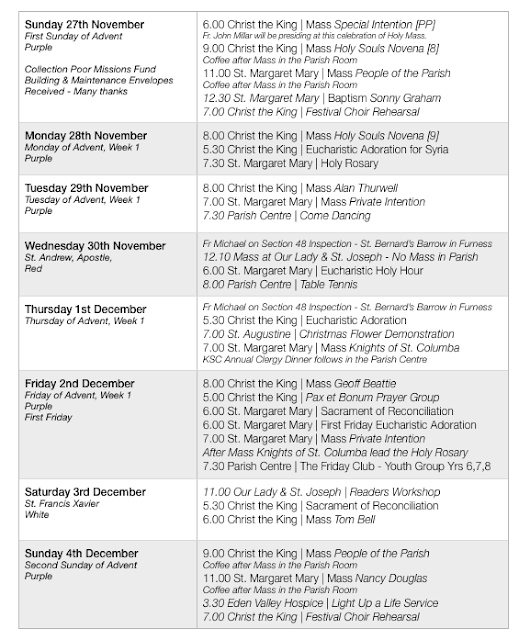 There are a number of opportunities to go to confession this week, please do so. On Tuesday 20th December at 7.00 pm at St. Margaret Mary. At least three priests will be available to hear confession. On Thursday 22nd December between 9.00 am and 10.00 am at Christ the King. On Friday 23rd December between 6.00 pm and 7.00 pm at St. Margaret Mary. On Saturday 24th December between 5.30 pm and 6.30 pm. The 8.00 am Christmas Morning Mass is for those who would appreciate an early Mass on Christmas Morning. As is traditional within the Diocese of Lancaster, the offertory collection at Christmas forms part of the annual taxable allowance to the parish priest. Gifts included in cards does not count towards this taxable income. Please remember to make a contribution to the Building and Maintenance Fund each month using the envelopes provided. Spares are available in the churches of the parish. At Mass last weekend 57+76+93 = 226. Thank you for your contribution to the parish of £419.57 + £268.36 = £687.93. Cumbria Community Foundation is encouraging people to donate to the Winter Warmth Appeal, which last year helped more than 1,000 older Cumbrians out of fuel poverty. Those in receipt of the Winter Fuel Payment who do not need it, can donate it to help those who cannot afford to heat their homes. www.cumbriafoundation.org/winter-warmth -fund/give-to-the-winter-warmth-fund or by telephoning 01900 825760. With the approval of Bishop Michael Campbell, Mass will be celebrated in the Extra-Ordinary From [according to the Missal of 1962] on the First Sunday of each month at 6.00 pm in Christ the King Church. This will begin on Sunday 5th February 2017. This is as a result of recent clergy moves in Carlisle and the need to serve the pastoral needs of those attached to the Extra-Ordinary Form in accordance with the Motu Proprio, Summorum Pontificum. Anyone is welcome to assist at this Mass, which fulfils the Sunday obligation to attend Holy Mass. The Bishop has announced that, in January, Fr Anthony Gaskin & Fr John Millar are moving to the parish of St John XXIII, Preston. The new parish priest of Our Lady of Eden – Our Lady & St Joseph’s and Warwick Bridge churches – is Fr Chris Loughran, currently in Preston. Please keep in your prayers all the priests who are moving in the new year and those now retiring. Many thanks to all the staff of the St. Ninian Catholic Federation for your hard work, professionalism and dedication during the Autumn term. Your work with the young people of the parish is very much appreciated. Thanks also to the governors of the federation for your commitment to Catholic Education in this part of Carlisle. Help is needed with the Children’s Liturgy of the Word during Mass on a Sunday morning, where we currently have only one volunteer assisting our young people. Are you willing to help? If no one comes forward to help, this will cease at Christ the King as of 1st January. The parish is looking for a gardener for the large garden at Christ the King. Can you recommend one? Pleas for help in the past have fallen on deaf ears…so we’ll have to hire one. They must be dog friendly. 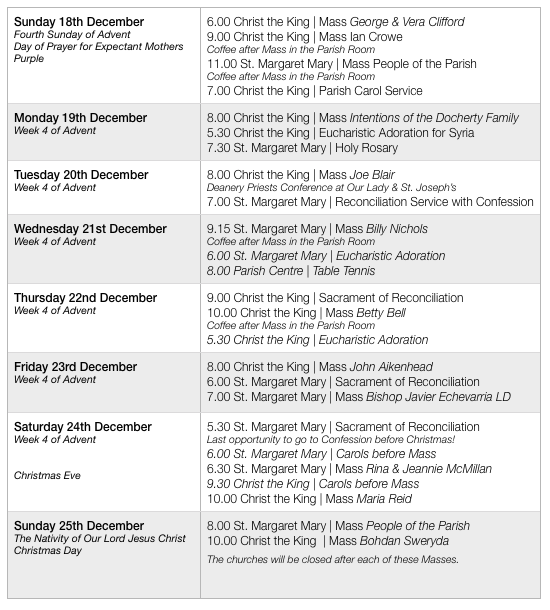 An ideal opportunity to go to confession before Christmas. On Tuesday 20th December at 7.00 pm at St. Margaret Mary. At least three priests will be available to hear confession - why not come along? Other opportunities for the sacrament will be available nearer Christmas but please take this opportunity to go to confession. Will take place on the evening of Sunday 18th December at 7.00 pm with refreshments afterwards in the Presbytery at Christ the King. All welcome. On Thursday 15th December we will be getting the Church of Christ The King ready for Christmas. We would appreciate some help to clean and decorate the church, assemble the crib and erect the large Christmas Trees on the Sanctuary. If you could spare an hour or so, we will be starting after coffee at 10.30 am. Many thanks. This annual event in the parish takes place on Wednesday evening at 5.30 pm at Christ the King. Walsingham Support is a leading national charity providing highly personalised services for around 400 people with learning disabilities, autism, brain injuries and complex needs. All are welcome to come along. Also on Wednesday evening, the schools of the St. Ninian Catholic Federation [St. Margaret Mary and St. Cuthbert] will hold a Carol Service at St. Margaret Mary on Wednesday Evening at 6.00 pm. All are welcome to come along. There will be a parish spiritual reflection on the celebration of Mass on Tuesday evening at St. Margaret Mary Church - all welcome. The Youth Group will resume after a break for Christmas and the New Year. Thank you to all who helped organise this celebration of the Sacrament of the Sick. If anyone who is poorly would like to receive the Sacrament of the Sick, please contact Fr. Michael directly. Thank you to all who have contributed to this collection of food and other items. Figures were not available at the time of publication. Churches Together has organised carol singing on Thursday 15 December at 6.30 pm in The Lanes by Primark, Carlisle. All welcome. Donations for Christmas Flowers will be gratefully received. There will be a retiring collection at Christ the King this Sunday, 11th December, for this purpose. Many thanks. Cumbria Community Foundation is encouraging people to donate to the Winter Warmth Appeal, which last year helped more than 1,000 older Cumbrians out of fuel poverty. Those in receipt of the Winter Fuel Payment who do not need it, can donate it to help those who cannot afford to heat their homes. www.cumbriafoundation.org/winter-warmth -fund/give-to-the-winter-warmth-fund or by phoning 01900 825760. Are you a doctor, nurse, hospital chaplain or other healthcare professional? … needing a restorative break? … interested in connecting work and faith? With the approval of Bishop Michael Campbell, Mass will be celebrated in the Extra-Ordinary Form [according to the Missal of 1962] on the First Sunday of each month at 6.00 pm in Christ the King Church. This will begin on Sunday 5th February 2017. This is as a result of recent clergy moves in Carlisle and the need to serve the pastoral needs of those attached to the Extra-Ordinary Form in accordance with the Motu Proprio, Summorum Pontificum. Anyone is welcome to assist at this Mass which fulfils the Sunday obligation to attend Holy Mass. Please return Red Mission Boxes which are to be emptied between now and the end of January - many thanks. Thanks to the Friends of St. Margaret Mary who have donated £500 towards the Building and Maintenance Fund. Cardinal Robert Sarah, Prefect of the Vatican Congregation for Divine Worship and the Sacraments, invited priests last July to consider celebrating Holy Mass facing the same direction as the congregation from the first Sunday of Advent. Having given this invitation serious prayerful thought, it is my intention to face the same direction as the people during the Eucharistic Prayer and Communion Rite [the way we celebrate Holy Mass on Friday evenings at St. Margaret Mary and on our parish feast day]. 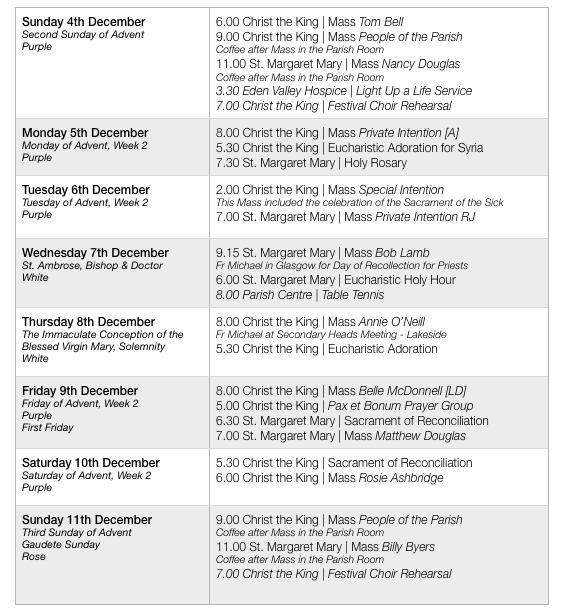 Mass will be celebrated in this way during the season of Advent and the season of Lent. Outside those seasons [i.e. Christmas, Easter and Ordinary Time] we will revert to the orientation where the priest faces in the opposite direction to the congregation. An information sheet is available for you to take away. There will be an opportunity to reflect on this way of celebrating Holy Mass on Tuesday 13th December at 7.30 pm at Christ the King to which all are invited. Thank you to those who came along on Wednesday evening. This will be held at Christ the King on Tuesday 6th December at 2.00 pm. Refreshments will follow in Harraby Catholic Club. All are welcome. The Sacrament of the Anointing of the Sick will be celebrated during this Mass. Meets on Sunday evening. We would welcome more people to join us as we get ready for Advent and Christmas. Why not come along and see what goes on? 57+59+91 = 207 were at Mass last weekend. Thank you for your offering last weekend of £436.75 + £227.82 = £664.57. Advent should be an opportunity to deepen our relationship with the Lord. 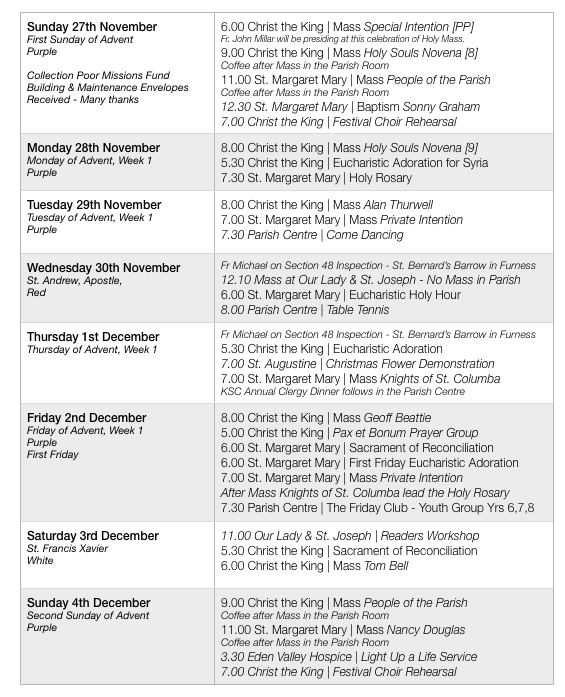 Two additional Masses are celebrated in this season - why not make an effort to attend Mass during the week? Eden Valley Hospice - Light Up a Light. The annual ‘Light Up a Life Service’, will be held in the grounds of the Hospice on Sunday 4th December at 3.30 pm. The annual Carol Service in Carlisle’s Anglican Cathedral will take place on Friday 9th December at 7.30 pm. Due to a poor response from parishioners last year, it was decided that there would be no Christmas Tree Festival at Christ the King this year. Thank you to those who helped organise the festival over the past two years. On Thursday 15th December, we will be getting the Church of Christ The King ready for Christmas. We would appreciate some help to clean and decorate the church, assemble the crib and erect the large Christmas Trees on the Sanctuary. If you could spare an hour or so, we will be starting after coffee at 10.30 am. Many thanks. Churches Together has organised a carol parade & hog roast on Thursday 8 December, beginning at 6.15 pm, from St Cuthbert’s churchyard. They have also organised carol singing on Thursday 15 December at 6.30 pm in The Lanes by Primark, Carlisle. All welcome. Cumbria Community Foundation is encouraging people to donate to the Winter Warmth Appeal, which last year helped more than 1,000 older Cumbrians out of fuel poverty. Those in receipt of the Winter Fuel Payment, who do not need it, can donate it to help those who cannot afford to heat their homes. www.cumbriafoundation.org/winter-warmth -fund/give-to-the-winter-warmth-fund or by phoning 01900 825760. The Novena of Masses for the Holy Souls concludes on Monday. Young people from Years 6,7,8 are invited to ‘The Friday Club’ on Friday 2nd December in St. Margaret Mary Parish Community Centre. The evening begins at 7.30 pm until 9.00 pm. Cost £2. 74+76+88 = 238 were at Mass last weekend. If you notice someone missing from Mass - why not give them a call to check they’re ok during the winter months? Thank you for your offering last weekend of £430.42 + £216.87 = £647.29. Thank you to all who supported this event - over £300 was raised for the Parish Building and Maintenance Fund. Fr John Millar will lead a workshop for Readers on Saturday, 3 December at Waterton Hall OL&SJ from 11.00 am - 2.30 pm. Tea, coffee and biscuits will be provided. Please take a packed lunch. All readers in the parish are encouraged to go along. John Dalton will give a flower demonstration on Thursday, 1 December from 7.00 - 9.00 pm in St Augustine’s church social room, Waverley Road CA3 9JU. Tickets will be £5 and include a glass of wine or juice. All proceeds to Mary’s Meals. Tickets on sale from Sarah Hinde - tel:016977-42650. Fr. Michael will be away on Wednesday and Thursday this week at St. Bernard’s Catholic High School in Barrow-in-Furness. The Cenacolo Community at Dodding Green, Mealbank near Kendal, is holding its pre-Christmas Open Day for Friends of the Community, on Saturday 3 December, from 10.00 am and concluding with an open air nativity presentation at about 4.30 pm, weather permitting! All welcome. This weekend we have a pastoral letter from Bishop Michael Campbell OSA, Bishop of Lancaster. The annual ‘Light Up a Life Service’, will be held in the grounds of the Hospice on Sunday, 4th December at 3.30 pm. The annual Carol Service in Carlisle’s Anglican Cathedral will take place on Friday, 9th December at 7.30 pm. Will take place on the evening of Sunday 11th December with refreshments afterwards in the Presbytery at Christ the King. All welcome. Cardinal Robert Sarah, Prefect of the Vatican Congregation for Divine Worship and the Sacraments, invited priests last July to consider celebrating Holy Mass facing the same direction as the congregation from the first Sunday of Advent. Having given this invitation serious prayerful thought, it is my intention to face the same direction as the people during the Eucharistic Prayer and Communion Rite [the way we celebrate Holy Mass on Friday evenings at St. Margaret Mary and on our parish feast day]. I intend to celebrate Mass in this way during the season of Advent and the season of Lent. Outside those seasons [i.e. Christmas, Easter and Ordinary Time] we will revert to the current orientation, where the priest faces in the opposite direction to the congregation. An information sheet will be available this weekend [which you are all invited to take away with you] and I will discuss this as part of our weekly parish catechesis [Vino et Veritas] on Wednesday 23rd November. Thank you to all who attended and prayed for those buried in Upperby Cemetery. Sunday evening at 5.00 pm at Christ the King. It concludes this weekend with the Solemnity of Christ the King with Solemn Benediction. 7.30 pm, a Polish prayer group gather at Christ the King church. Prayer for adults in the church and children in the parish room. 54 + 62 + 94 = 210 were at Mass last weekend. If you notice someone missing from Mass - why not give them a call to check they’re ok during the winter months? Thank you for your offering last weekend of £453.67 + £266.15 = £719.82. On Tuesday 22nd November from 7.30 pm in the Parish Centre. Tickets are £5 and available from the centre - proceeds in aid of the Building and Maintenance Fund. Please come along. The sacristy at St. Margaret Mary will shortly be undergoing a process of refurbishment which includes some improvements to lighting, better storage for the sacred vestments, redecoration and new flooring. This may cause some disruption to normal routines and a certain disharmony to familiar areas. Please be patient during this work which is undertaken for the glory of God and the Blessed Mother. Contributions towards this project can be made through the Building and Maintenance fund envelopes. Come and learn more about your faith over a glass of wine [non-alcoholic beverages will also be available]. Wednesday evening catechesis at Christ the King beginning at 7.30 pm. The topic for this part of the year is ‘What’s the Mass really about?’ All are welcome to come along. John Dalton will give a flower demonstration on Thursday 1 December from 7.00 - 9.00 pm in St Augustine’s church social room, Waverley Road CA3 9JU. Tickets will be £5 and include a glass of wine or juice. All proceeds to Mary’s Meals. Tickets on sale from Sarah Hinde - tel:016977 42650. As the Year of Mercy comes to a close - please think about going to Confession. Frequent confession is good for you…and the world. Its a bit like dusting the house: a little often is better than trying to do it all at once. 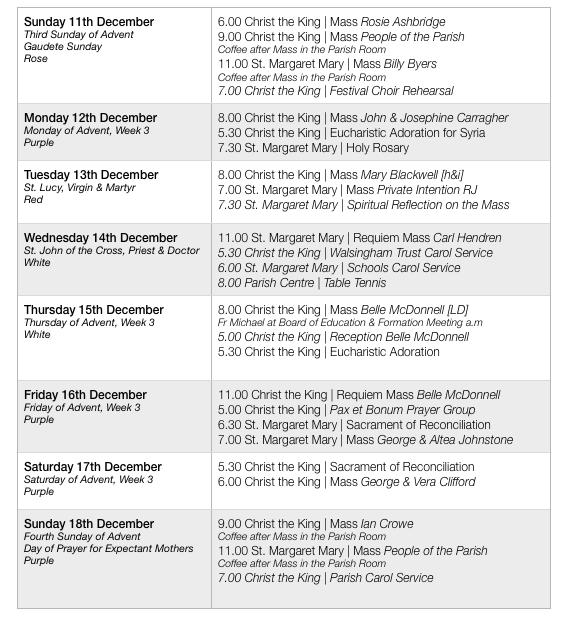 Please note the ‘winter’ time for adoration at Christ the King of 5.30 pm.